ZCore+ | O'Brien Dental Lab, Inc.
Over the years, Zirconia has proven to be sufficiently strong when used as a core material. However, due to a number of differences in the handling characteristics of zirconia versus metal alloys, the structural makeup of veneering porcelain is significantly different. 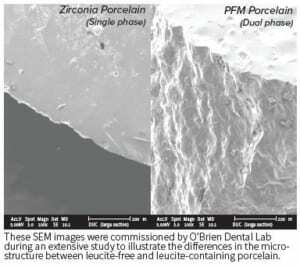 As a result, while zirconia porcelain is very esthetic and kind to opposing dentition, it does have a fracture toughness that is 33% lower than porcelain used for PFMs. Therefore, copings and frameworks that provide optimal porcelain support are crucial to the durability of zirconia-reinforced restorations. Clinical studies, as well as our own observations based on 50,000+ units fabricated over the past 15 years, reveal that there is a higher incidence of chipping of the veneering porcelain with these restorations. 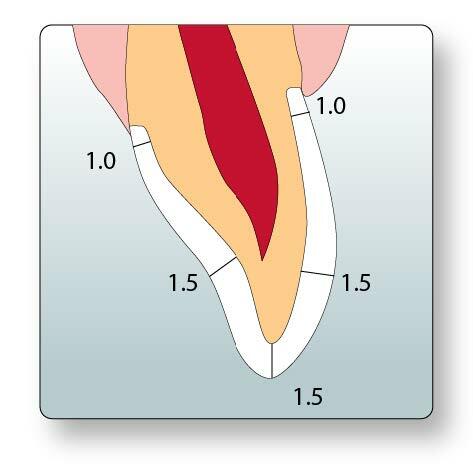 Although many manufacturers advocate the use of porcelain fused to zirconia restorations in all areas of the mouth, we recommend restricting their use to single crowns and 3-unit bridges in the anterior region. Cases involving posterior teeth can only be recommended with prior case consultation and evaluation. ZCore+ restorations can be conventionally cemented with your crown and bridge cement of choice. Due to its crystalline structure, zirconia crowns cannot be etched and therefore cannot be adhesively bonded. For increased adhesion through chemical bonding, Multilink® Automix by Ivoclar is recommended.